PLEASE PROVIDE US WITH A COPY OF YOUR RESALE CERTIFICATE or TAX EXEMPTION FORM TO AVOID BEING BILLED FOR SALES TAXES and FOR OUR FILES. Send to our FAX: 1 718 357 4447 and/or Email: [email protected] prior to or upon ordering. Resale Value for boutiques and shops: $136.00 per pack. The most original road to musical fun with friends and family. Open Share Play! 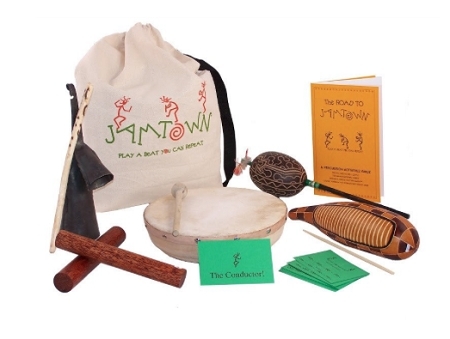 5 Instruments* plus The Road to JAMTOWN Activity Guide, Simple Rhythm™ Cards & JAMTOWN Travel Bag. Includes: Gourd Scraper w/ Rasp - Peru J001, Wingo Nut Shaker - Peru/Amazon J0016, Double Bell w/ Striker - Ghana J004D, Frame Drum - Indonesia J005, Large Coconut Palm Claves - Indonesia J012.